If you're interested in a good review of the history of fatherhood programs in the U.S., look no further than Making Good on Fatherhood: A Review of the Fatherhood Research, a recent review produced by the Child and Family Research Partnership at the University of Texas at Austin. I've read many reviews of the history of fatherhood programs in my 17 years with National Fatherhood Initiative®. This review is one of the best because it not only covers the history of fatherhood programs, it also summarizes the research that's been done on them and the research that's now underway to help us learn even more about what works to better involve dads in the lives of their children. The history of fatherhood programs. The state of fatherhood program research in: father involvement, economic stability, healthy relationships, child abuse and neglect prevention, and ongoing studies and evaluation. Despite the review's distinctly Texas flavor (one this Texan finds quite tasty, I might add), you'll benefit from reading this excellent review regardless of the fathers you serve and in which part of this country you serve them. 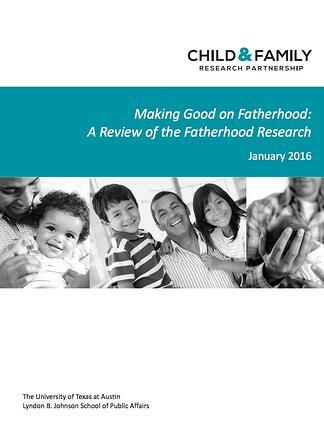 Download your copy today by visiting Making Good on Fatherhood: A Review of the Fatherhood Research! How much do you know about the history of fatherhood programs in the U.S.? How much do you know about the research that's been done on the effectiveness of fatherhood programs?